Less than TWO WEEKS! Let’s Check out TEAM Keith’s Progress! 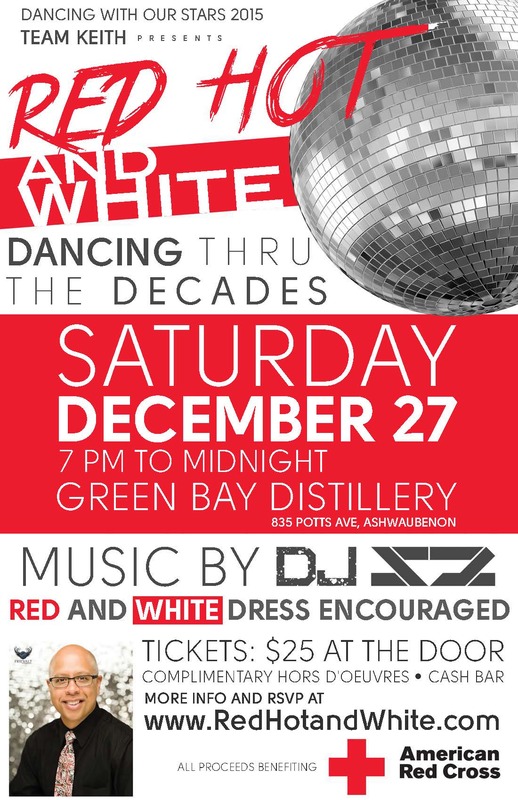 Red Hot & White – Dancing thru the Decades! Tis the season, we all need a good workout! 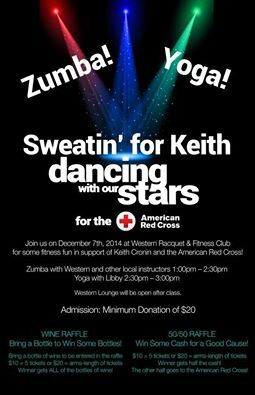 Join us Sunday, December 7, for Zumba and Yoga to support DWOS15 Dancer Keith Cronin. We KNOW he has Zumba moves, but maybe he will show us a sneak peek of his ballroom moves too? 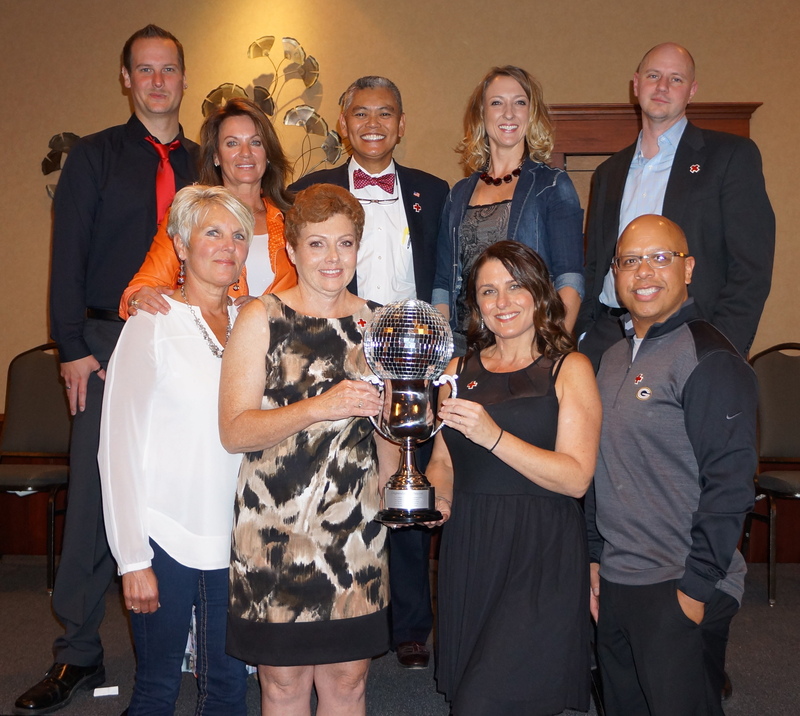 Celebrity Bartender Night: Dancing with Our Stars 2015 Team Keith! 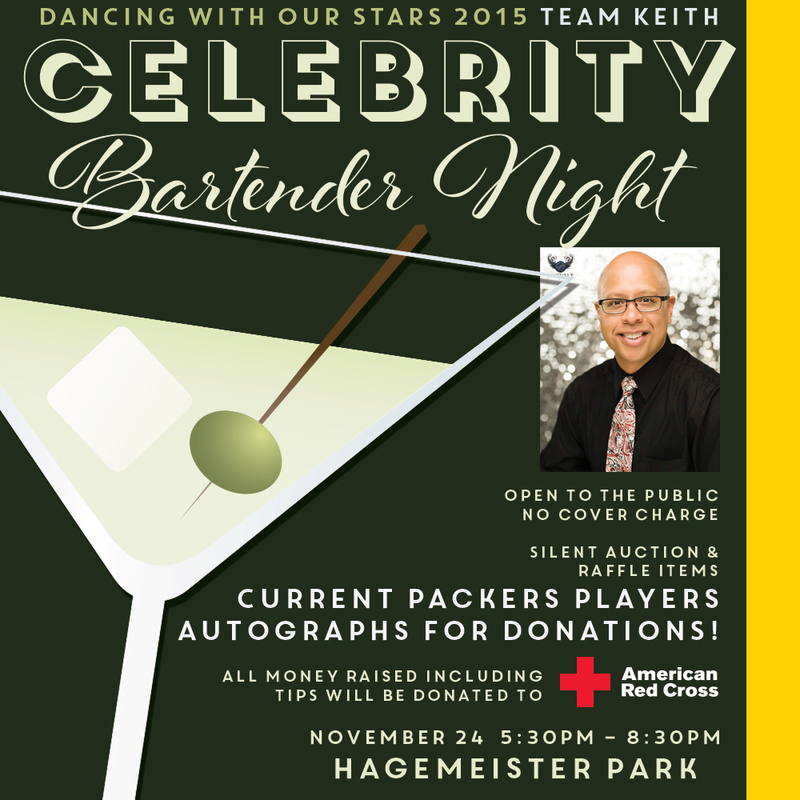 Join Dancing with Our Stars dancer, Keith Cronin of the Green Bay Packers and guest bartenders Bianca White, Erin Longley & former Packers player, Johnathan Franklin at Hagemeister Park on Monday, November 24 to help raise funds for the American Red Cross and his DWOS15 campaign to win the coveted, fundraising Mirrorball Trophy. · Silent auction and raffle items. I have always enjoyed music and been told a few times “I’m a good dancer and I have rhythm” – but the biggest milestone around dancing is when I was the lead choreographer for an all-male talent contest in high school – called Mr. Park at Washington Park High School in Racine. My dream dance partner is someone with a level of talent that makes me look good! As for my favorite dancer of all-time on ABC’s “Dancing with the Stars”, it’s not easy to answer as there are many talented dancers on the show. But being a male, If I may narrow it down to two pro’s and two guest stars: Derrick Hough and Val Chmerkovskiy / Corbin Bleu and James Maslow. Outside of work and household chores, I enjoy spending quality time at the gym as fitness and a healthy lifestyle is an important part of my life. I enjoy spending time outdoors, social time with friends/family and movies. I am supporting the American Red Cross because I am always willing to volunteer my time to a worthwhile cause or organization and their efforts. 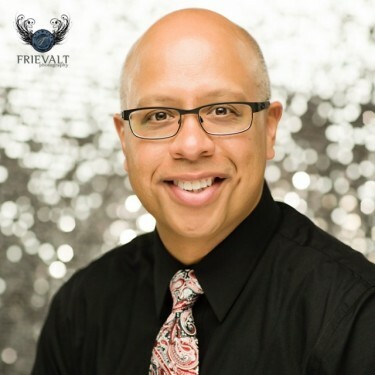 Serving as a contestant for the 2015 DWOS offers an exciting way to raise money while accepting the challenge of something completely new to me and having fun every “dance step” of the way! Kim Peeters – Vice President/COO, Coldwell Banker – The Real Estate Group, Inc. The person who raises the most money between now and the end of the event will be awarded the coveted Fundraising Mirror Ball Trophy. All funds raised support disaster prevention, preparation and relief, the life-saving training of first aid, CPR/AED classes, collection and testing of blood and blood products, support to military members serving around the globe and international programs. Last year’s event raised a record $500,000 for the local Red Cross. Jim Rivett, President of Arketype, Inc. took home the Fundraising Mirror Ball Trophy after raising $200,000, which also set a record for personal fundraising. Rane Cegelski, Bruce Marshall Dance Studio, Simply Ballroom of Green Bay and TC Dance Club of Appleton are the participating dance partners for the event. Peta Murgatroyd, who teamed with Green Bay Packers legend Donald Driver to win Season 14 of ABC-TV’s Dancing with the Stars, will once again serve as a celebrity judge at the event.